Just as we can write and install apps in our electronic devices, we can construct “mindapps” and install them in our brain-mind complex, and as just as digital apps add capabilities to our devices, mindapps can expand our mental powers and creative abilities, allowing us to intentionally redesign our minds. Using psychedelics as the prime example, Thomas B. Roberts explores the many different kinds of mindapps, including meditation, other psychoactive plants and chemicals, sensory overload and deprivation, biofeedback and neurofeedback, hypnosis and suggestion, sleep and lucid dreaming, creative imagery, transcranial brain stimulation and optical brain stimulation, rites of passage, martial arts and exercise routines, yoga, breathing techniques, and contemplative prayer. He also looks at the future of mindapps, the potential for new mindapps yet to be invented, and how installing multiple mindapps can produce new, yet to be explored mind states. Drawing on decades of research, he shows how psychedelics in particular are “ideagens”--powerful tools for generating new ideas and new ways of thinking. Uniting the many forms of mindapps into one overall Multistate Mind Theory, Roberts examines the singlestate fallacy--the myth that useful thinking only occurs in our ordinary awake mental state--and demonstrates the many mind-body states we are capable of. 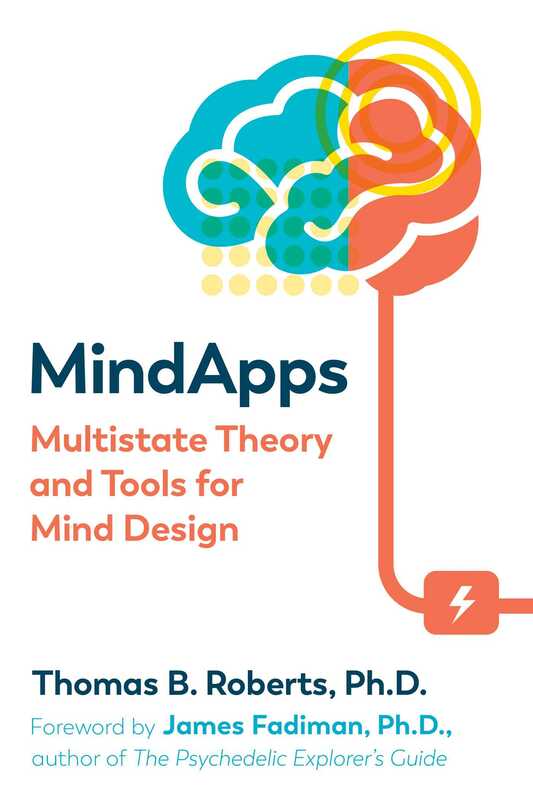 He shows how mindapps not only allow us to design and redesign our own minds but also offer benefits for artistic performance, mystical and spiritual experience, and scientific research by improving creativity, open-mindedness, problem solving, and inner-brain connections. Reformulating how we think about the human mind, Mindapps unveils the new multistate landscape of the mind and how we can each enter the world of mind design. From a period of describing, prescribing, and augmenting the human mind in our ordinary default state (awake), we are advancing to a new era of mind design. Briefly, we can increase the repertoire of our mental processes--sensory and cognitive, physiological and mental, conscious and unconscious--by installing a large and constantly increasing number of what I call mindapps in our brain-mind system. This advance produces new research questions and paradigms, refreshes approaches to standard scientific and humanistic topics, and broadens the wider intellectual world by opening the door to our minds’ greater futures. Because they are receiving so much scientific, professional, and media attention and because psychedelics are the most dramatic common family of mindapps, this book uses them to exemplify the wider field of mindapps and to illustrate the fruitfulness of the Multistate Theory. Recognizing that psychedelics stimulate ideas, I coined ideagento use when they do so. Ideagenis not a synonym for psychedelic. It refers to psychedelics only when they produce ideas. When other mindapps produce ideas, they qualify as ideagens then too. What other ideas have I come up with? Therest of this chapter elaborates on them. 1. Because of the ambiguity of the word consciousness, in the Multistate Theory the word mindbody replaces consciousness when it refers to overall patterns of mind plus body functioning at any onetime, and mindbody state replaces state of consciousness. 2. Mindapps.Mindapps are methods of altering overall patterns of biological, behavioral, and cognitive processes, and just as we can write digital apps and install them in our electronic devices, we can create bio-information mindapps and install them in our brain-mind complex. 3. When we ask if there are other mindapps besides psychedelic ones, we recognize many other mindapp families, thus generating Multistate Theory. 4. Residenceis the recognition that all behavior and experience reside in (are expressions of) their respective mindbody states, and its Central Multistate Question promotes new hypotheses, research agendas, questions, and methods. 5. Mind design--recipes for combining several mindapps will produce new, previously never-experienced, “artificial” mindbody states. 6. MindappAI will extend the human brain-mind complex and contain previously unknown human experiences and capabilities. If systematically pursued, this founds a new intellectual activity. These enrich our fund of ideas. As the next chapter proposes, mindapps, both psychedelic and non-psychedelic, can be combined to form new, artificial mindbody states in the brain-mind complex: thus, the future of the human mind is unlimited. As Part 2 of this book shows, reconceiving drug studies supports new adventures in scientific, humanistic, religious, educational, and cultural thinking. In chapter 10 I show how the Multistate Theory meets 7 of the 8 criteria of a paradigm shift, and as a consequence of revolutionarydrug studies, drug laws and drug policies will need to be updated too. The singlestate fallacyis the major theoretical impediment to the Multistate Theory. What I call “the singlestate fallacy” is the hegemonic assumption that all worthwhile thinking takes place only in our ordinary, default mindbody state. It assumes that other mindbody states contain no knowledge, have no practical uses, and are epistematically empty. Thanks to a rapidly filling reservoir of evidence, though, psychedelic research breaks through that isolation and destroys the singlestate fallacy. In contrast to the singlestate fallacy, the Multistate Theory recognizes that the ability to produce and use a variety of mindbody states is a significant human trait, and multistate phenomena, deserve their place in our studies of the human mind. This is not to denigrate our knowledge of our ordinary, default state. Far from discarding existing information, a new paradigm “must promise to preservea relatively large part of the concrete problem-solving ability that has accrued to science through its predecessors”. The Multistate Theory encompasses our ordinary state and especially values it as the mindbody state that has been most thoroughly studied. Existing singlestate findings contribute toa whole multistate map of our minds, and established research on our usual, default state sets high standards for methods, questions, and topics that the nascent studies of other states might emulate. Mindbody states are overall patterns of cognitive andbodily functioning at any one time. They are composed of body plus mind considered as one unified whole, not as different things closely interacting. Thus, the hyphen in mind-body is dropped. Usually when we think of technologies, we think of electronic, biological, or mechanical technologies. Mindappsinstall mindbody states. They are currently an under-recognized class of biotechnologies. Among mindapps are families of selected exercise routines, meditation, psychoactive plantsand chemicals, yoga and the martial arts, sensory overload and sensory deprivation, hypnosis and receptive relaxation, sleep and sleep deprivation, chanting, dream work, breathing techniques, biofeedback and neurofeedback, transcranial magnetic stimulation, biohacking, CRISPER and other genetic techniques, contemplative prayer, vision quests, selected practices in Eastern and indigenous religions, drumming, and many (perhaps thousands) more. Furthermore, each of those listed here is not just one, lone mindapp, but a whole family of related mindapps, such as the many types of meditation and contemplative prayer. They all contribute to the Multistate Theory.